A genetic mutation – or the miracle of photoshopping? Either way, this amuses. Thank you, Caroline Leavitt, for sending it along! 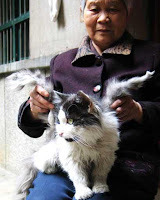 Here's the link to the supposed news article about this Chinese winged cat, who supposedly sprouted wings to escape sexual harrassment. In other news, I've been busy with Probable Claws revisions and a bunch of outside projects. One of which involved me having coffee with Tana French in the Oak Room! I'll post more of that when the interview pubs next week.